Gallery of the Mountains, located inside the Omni Grove Park Inn, will feature Asheville artist and illustrator Al Ramirez on Friday, July 7 from 1 - 5pm. 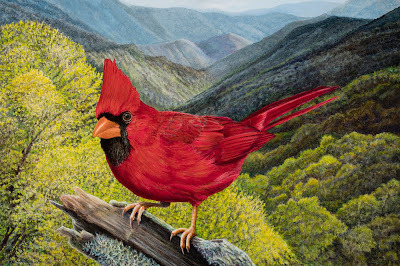 Al will be working on a painting of a female cardinal, and will demonstrate brushwork techniques in oils. Several fine art prints and original works from Al’s popular Mountain Birds series will be on display and available for sale. Al Ramirez has had a long career as a working artist. Highlights include working as a comic book colorist, finisher, and co-illustrator with collaborator and good friend Jackson “Butch” Guice, a nationally known comic book artist. From 1984 to 1992, Butch and Al worked on Superman with DC Comics, followed by the X-Factor graphic novel, Nightbreed, Hellraiser, and various projects for Action and Acclaim Comics. Al has also done a number of commissioned illustrations and free-lance art projects, including paintings for the Tri-Star movie Private Eyes starring Don Knotts and Tim Conway, shot in Asheville, NC.